As government interactions move beyond the website, citizens are increasingly being offered the chance to learn about and communicate with government agencies and officials in a wide range of online spaces such as blogs, social networking sites and mobile devices. These new tools also offer citizens the opportunity to participate in the broader online debate surrounding government policies and issues, whether by communicating directly with government entities online or by organizing with others to push for changes in government policy. In examining the intersection of social media and engagement with government, we first asked about the use of these services for informational purposes—in other words, using online tools such as text messaging, online social networks or blogs to keep up-to-date with what government agencies or officials are doing. In total, 31% of internet users did at least one of these six activities—throughout this report, we will refer to these individuals as government social media users. Among those who access government information in this way, a majority (56%) do so using one channel or technology, while 44% took part in two or more of the above activities. Demographically, government social media users look fairly similar to the internet population as a whole, with the main differences centering on income and education. Government social media users are somewhat more affluent than the overall online population (36% have a household income of $75,000 or more per year, compared with 27% of the online population). They also have relatively high levels of education—nearly half of government media social media users (46%) have graduated from college, compared with around one third of all adult internet users (35%). From the standpoint of race, age and gender government social media users look just like internet users as a whole. Three-quarters of government social media users (76%) access the mobile internet and nearly nine in ten (88%) have a broadband connection at home. 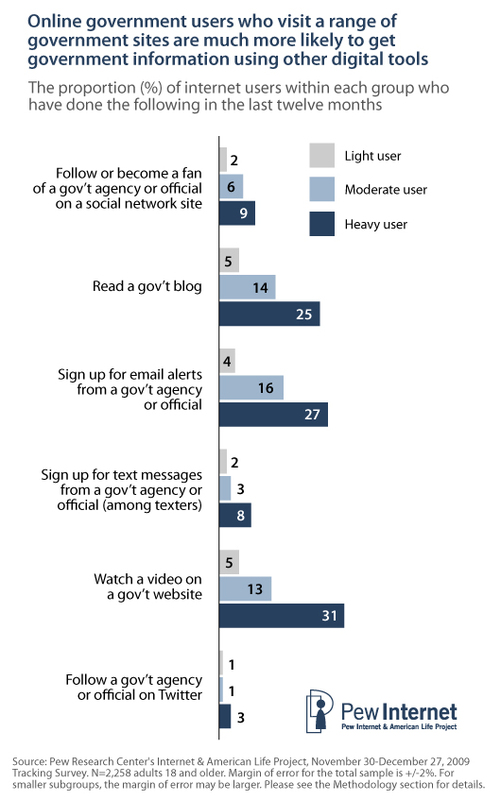 Government social media users take advantage of a range of online and offline government platforms. Fully 95% of government social media users visited a government website in the preceding twelve months, with the typical government social media user visiting five such websites. Additionally, two-thirds (66%) contacted a government agency or official in person, by phone or by letter in the last year. With this profile of the typical government social media user in mind, we can look individually at the different digital platforms that make up our definition of government social media users, with an eye towards which demographic cohorts are especially likely to use these different tools. As noted above, government social media users tend to be more affluent and well-educated than the internet population at large. 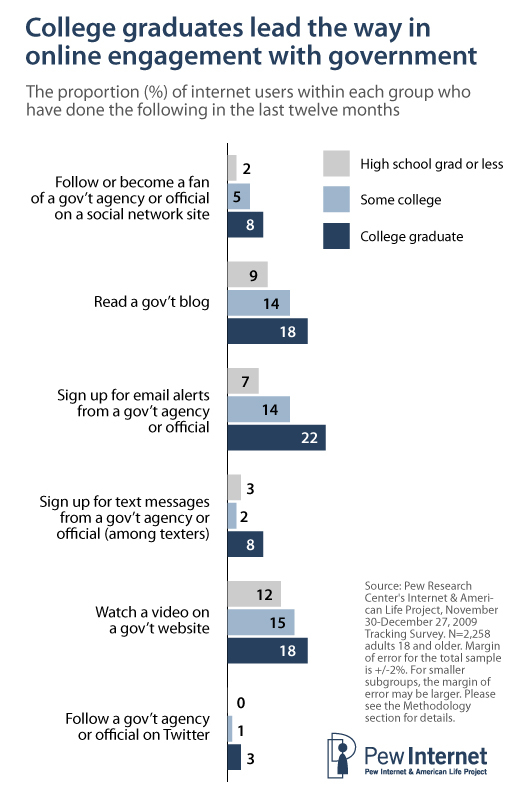 Compared with those who have only attended high school or who have attended college but not graduated, those with a college diploma are significantly more likely to follow a government agency or official on a social networking site (14% of such profile owners have done so, representing 8% of online college graduates) and to sign up for email or text message alerts from an agency or official (22% of online college grads have signed up for email alerts, while 8% of college graduates who use text messaging have signed up to receive government information in this way). 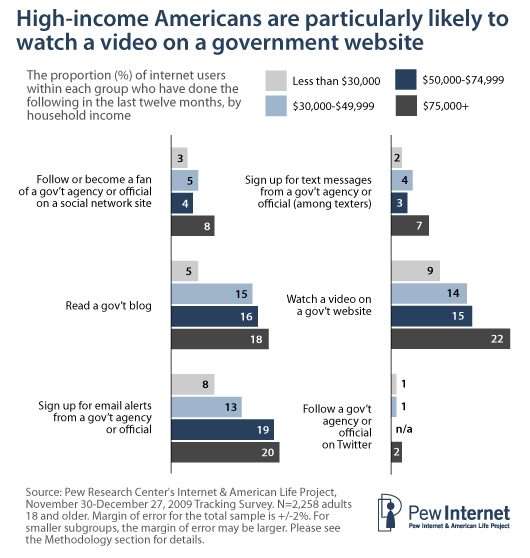 In terms of income, watching videos on a government website is particularly popular with high-income internet users. One in five internet users earning $75,000 or more per year (22%) watched a video on a government website in the preceding year, compared with 15% of those earning $50,000-$74,999, 14% of those earning $30,000-$49,999, and 9% of internet users earning less than $30,000 annually. High-income internet users are also more likely than lower-income internet users to sign up for email alerts, or to follow a government agency or official on a social networking site. 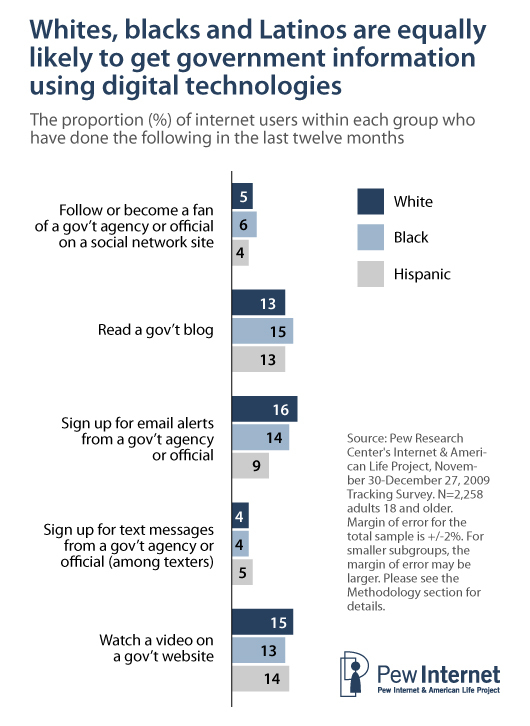 The government social media user cohort looks similar to the online population as a whole in its racial and ethnic makeup, and African-Americans and Latinos are just as likely as whites to use tools such as text messaging, blogs and online social networks to get information from government agencies and officials. Among internet users 31% of whites, 32% of African-Americans and 28% of Latinos are government social media users, and there is no significant variation between these groups when it comes to any of the individual tools we evaluated. There is also relatively little variation between age cohorts when it comes to using individual platforms to access government information. Indeed, seniors are just as likely as young adults to access government information in this way—31% of online 18-24 year olds and 30% of those ages 65 and older are government social media users. Those ages 35-44 are actually the most likely age cohort to interact with government using digital tools, as 37% of such internet users are government social media users. Finally, the larger the number of government website interactions an individual takes part in, the more likely that individual is to engage with government agencies and officials using other digital tools such as email, blogs, social networking sites or online video. Thus far we have discussed digital communication tools such as blogs, email and text messaging in the context of information seeking. In the remainder of this section, we will examine the extent to which Americans are going online to communicate directly with government agencies and participate in the online debate over government issues and policies. Based on the results of this survey, individuals who follow government officials or agencies on social media platforms are at this time mostly engaged in information-seeking as opposed to interaction with the agencies they follow. For example, 11% of those who read the blog of a government agency or official have posted their own comments on that blog for others to read. Since 13% of internet users read government blogs, that works out to only 2% of all internet users who have commented on the blog of a government official or agency. Posting comments is somewhat more common among those who follow government agencies or officials on an online social network: 20% of those who follow an agency or official on such a site have posted comments on the agency’s fan page or profile. However, because a relatively small number of people follow government agencies or officials on social networking sites, that works out to just 1% of all internet users who have done this. We also asked about government interaction using Twitter, but the number of Twitter users who follow a government agency or official is too small to report these findings. These results should not imply that Americans are not involved in online discussions around government issues or policies—these conversations are simply taking place within the broader online environment rather than on “official” government blogs or fan pages. In the twelve months preceding this survey, one in ten internet users (11%) posted comments, queries or other information related to government policies online, while 7% of internet users uploaded videos or photos online related to a government policy or issue. An additional 12% of internet users joined a group online that tries to influence government policies, and 3% participated in an online town hall meeting. Taking all of these activities together, nearly one quarter of internet users (23%) have posted comments or interacted with others online around government policies or public issues. Throughout this report, we will refer to these individuals as online government participators. Perhaps unsurprisingly, online government participators tend to use new digital tools to keep up with what government is doing—58% are government social media users. As a result, the demographic profiles of online government participators and government social media users are quite similar. Online government participators tend to be somewhat more educated and affluent than the online population as a whole—36% have an annual household income of $75,000 or more, and half (50%) have graduated from college. Relative to those with lower levels of income and education, these wealthy and well-educated online participators are especially likely to join online groups that seek to influence government policies and to post their own comments about government issues in online forums. 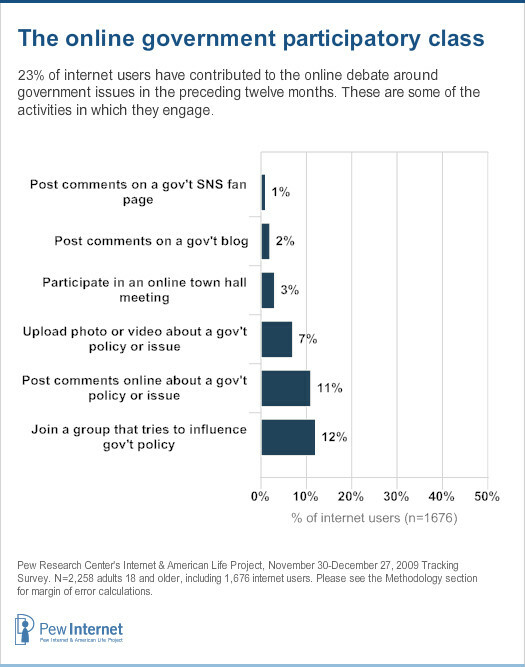 Online government participators are also highly engaged in a range of other online government activities. Nearly all government participators (98%) visited a government website in the preceding twelve months, and more than half (56%) visited five or more different government websites. On a typical day, 44% of online government participators look online for news or information about politics and 17% look for information on a local, state or federal government website on a daily basis. Despite (or perhaps because of) their involvement in the debate over government issues, they do not exhibit greater levels of trust in government institutions than other internet users. Unlike government social media users—who mirror the overall internet population in terms of their racial makeup—the online government participator population is more heavily composed of whites. Whites make up 69% of internet users but 78% of online government participators; meanwhile, African Americans and Latinos together comprise 23% of the online population but 14% of government participators. This racial imbalance is clearly visible when we examine individually the different activities that comprise our definition of online government participators. 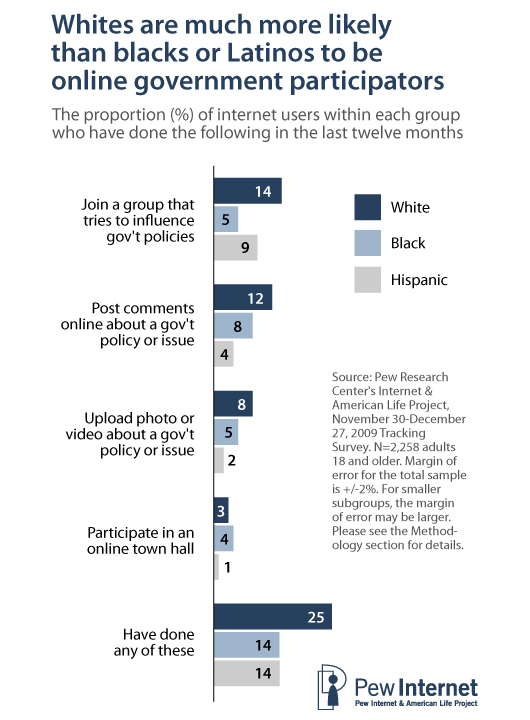 Online whites are significantly more likely than Latinos to post their own comments online about a government policy or issue (12% vs. 4%), upload photos or videos relating to government policies (8% vs. 2%) and participate in an online townhall meeting (3% vs. 1%). They are also more likely than African Americans to join a group online with the goal of influencing government policies (14% of online whites have done so, compared with 5% of online blacks). For the other activities in our government participator definition (posting comments on a government blog or social networking site fan page) the sample size of respondents who take part in those activities is too small to provide meaningful comparisons beyond the total population level.